Vancouver, Canada, March 21, 2019 – Further to its News Release of November 19, 2018, Medgold Resources Corp. (TSX-V: MED) is pleased to announce details of its forthcoming drilling program at the Tlamino Project (the “Project” or “Tlamino”) in southern Serbia. The objective of the 2019 program will be two-fold: to seek extensions of the gold mineralization defined at the Barje Prospect in 2018, and to drill exploration targets at Karamanica including a 2km long Induced Polarization (“IP”) chargeability anomaly within a 2km by 1.5km gold-in-soil anomaly. Management believes that the IP anomaly represents the continuation of a mineralized structure into Medgold’s tenement along strike from underground mine workings at Podvirovi currently being put into production by Mineco Limited. The Company also announces final results of its 2018 program, received since its news release of November 19, 2018. The 2019 exploration program remains fully funded by Fortuna Silver Mines Inc. (NYSE: FSM) (TSX: FVI) (“Fortuna”) and directed by a joint Fortuna-Medgold technical committee pursuant to the terms of the Tlamino Option Agreement announced on May 1, 2017. 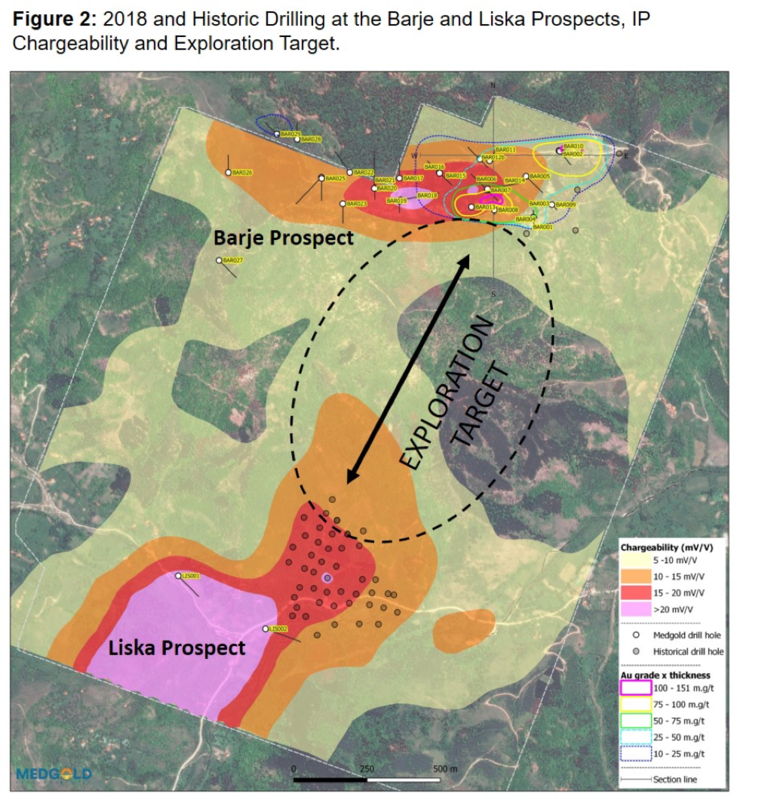 Medgold intends to pursue a program of up to 5,000m of diamond drilling in the areas of Barje, Liska and Karamanica during its 2019 exploration program. 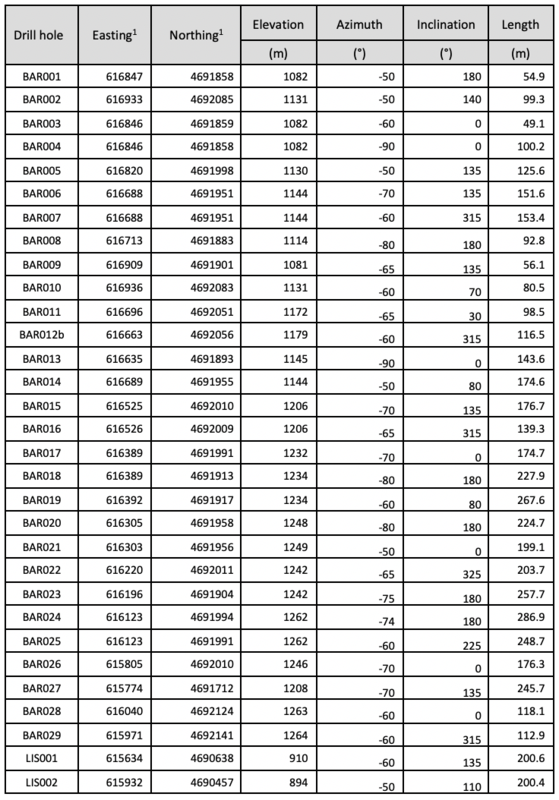 Results from the 31 drill holes of the 2018 drilling program, including the results of the 11 drill holes received after the Company’s November 19, 2018 news release are shown in Figures 1 and 2, and Tables 1 and 2 below. Based on 3D re-interpretation of drill data and geology, the previously-announced 500m by 400 m mineralized zone at the Barje Prospect is now seen to extend 700m east-west by 250m north-south within a structurally-bound, shallowly-dipping hydrothermal breccia below altered schist. This mineralization ranges in vertical grade-thickness from 10 to 151 meters and appears to be bounded to its south by a fault. Drilling west of this zone returned only sporadic intervals of gold mineralization. The Liska Prospect is situated 1.5km southwest of and around 300m vertically lower than Barje. Approximately 5,000m of drilling was completed pre-1980 at Liska by Yugoslav State Agencies from which a 15 to 40m thick, tabular zone of lead-zinc mineralization was reported(1), associated with a flat-lying boundary between schist/gneiss and overlying units in an area of approximately 300 by 450m; State Agencies reported a historic Mineral Resource Estimate for this area as 4.863 million tonnes at 0.54% Pb and 1% Zn in B+C1 Resource categories(2). (1) Bilans Rezervi Čvrstih Mineralnih Sirovina, Republike Srbije (Balance Solid Mineral Reserves, Republic of Sebia). Geozavod, Belgrade (1998). (2) While it is known that drilling and minor underground development for exploration were carried out at Liska pre-1980, a Qualified Person has not completed sufficient work to classify the historic Mineral Resource Estimate as current Mineral Resources or Mineral Reserves. Key assumptions, parameters, and methods used in its preparation are moreover unknown, and systematic precious metal analyses were not performed. As such Medgold is not treating the historical Mineral Resource Estimate as either current Mineral Resources or Mineral Reserves. Mineral Resources calculated as B+C1 Resource categories in the former-Yugoslavia would be equivalent to Mineral Resources of Indicated or Measured category within the CIM Definition Guidelines relating to NI 43-101. The boundary associated with the historically-reported mineralization at Liska potentially represents the continuation of the host structure identified at Barje. 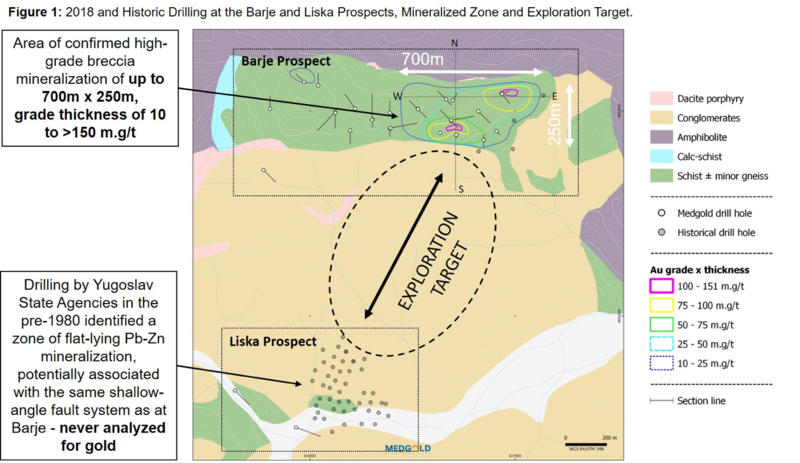 Medgold’s 2019 drilling program at Barje-Liska will focus on a 1km target zone between Barje and Liska, with the objective of exploring between the two prospects. This area is covered by a conglomerate sequence believed to be between 10 and 200m thick. Historical mineralization at Liska falls on the margin of a chargeability anomaly identified by an IP geophysical survey carried out by Medgold during 2017 and extended during 2018. Medgold drilled two holes south of the historically-reported mineralization during 2018 (Figure 2) which intersected only weak mineralization. Located approximately 8km northwest of Barje, the Karamanica Zone is characterized by a 2km by 1.5km gold-in-soil anomaly in which samples returned values generally above 0.1 ppm gold. Within this anomaly locally-elevated concentrations of Ag, Cu, Pb, Zn, As and Sb are seen to form distinct NW-SE linear features (Figures 3-6 below), which are in turn partly co-incident with marked IP chargeability. These exploration targets will be tested by drilling as part of Medgold’s 2019 exploration program. The strong, linear, chargeability anomaly trending NW-SE through the area follows the trend of a fault structure associated with reported mineralization from historic drilling and underground workings at the Podvirovi polymetallic showing (Figure 7 below). Podvirovi is held in a mining permit by Bosil Metal doo, a subsidiary of Mineco Limited, adjacent to Medgold’s landholding. A historic Mineral Resource Estimate for Podvirovi was listed by Yugoslav State Agencies in 1989 as 2.216 million tonnes at 3.07% Pb, 3.06% Zn and 0.87% Cu in A+B+C1 Resource categories(3). (3) While it is known that drilling and underground development for exploration were carried out at Podvirovi pre-1980, a Qualified Person has not completed sufficient work to classify the historic Mineral Resource Estimate as current Mineral Resources or Mineral Reserves. Key assumptions, parameters, and methods used in its preparation are moreover un-known, and systematic precious metal analyses were not performed. As such Medgold is not treating the historical Mineral Resource Estimate as either current Mineral Resources or Mineral Reserves and notes that evidence of minerali-zation on the adjacent property is not necessarily indicative of mineralization on Medgold’s property. Mineral Re-sources calculated as A+B+C1 Resource categories in the former-Yugoslavia would be equivalent to Mineral Resources of Indicated or Measured category within the CIM Definition Guidelines relating to NI 43-101. 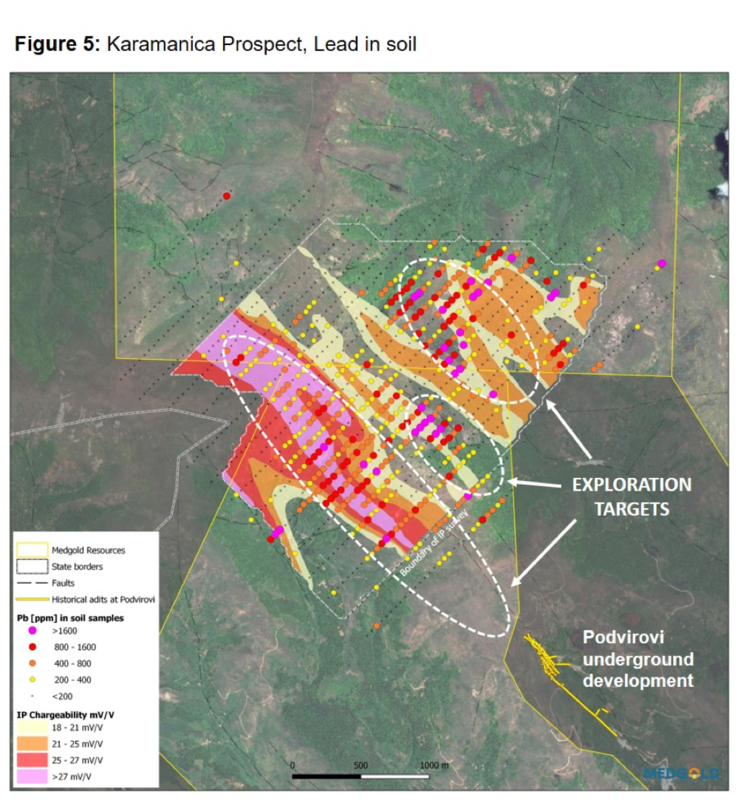 In addition to the exploration targets defined along the possible continuation of the Podvirovi structure, the geochemical and geophysical anomalies mentioned above also give rise to exploration targets in areas of similar structure and lithology to that hosting mineralization at Karamanica. Additional maps and information for Barje-Liska and Karamanica are available on Medgold’s website at http://medgoldresources.com/tlamino/. Table 1 – Barje Drill Intercepts, 2018. Including final assay results and estimation of vertical thickness. 1 – Coordinates are given in WGS84 datum and UTM zone 34 projection. The Project is located in Southern Serbia, close to the borders of both Bulgaria and Macedonia, five hours south of Belgrade. Tlamino is comprised of two exploration licenses, Donje Tlamino and Surlica-Dukat, each approximately 100sq.km. All exploration work at the Project is fully-funded by Fortuna, which has an option to earn up to 70% of the Project by spending US $8 million on exploration over five years and completing a Preliminary Economic Assessment (see Medgold news release of March 7, 2017). The scientific and technical information in this new release has been prepared and approved by Mr. Thomas Sant, FGS, CGeol, EurGeol, who is a Qualified Person as defined by National Instrument 43-101. Mr Sant has provided consulting services to Medgold since 2017. Geophysical data from 2017 was collected by Géophysique TMC of Val-d’Or, Canada. Géophysique TMC’s report, prepared by Joël Simard, P.Geol./Geoph. (Ontario), was reviewed to verify that information presented in this News Release is consistent with the report’s findings and that no quality issues were reported during data collection or processing. Geophysical data from 2018 was collected by Enerson Mühendislik Sond. Mad. Pet. Jeo. Mak. Elek. San. Tic. Ltd. Şti. (“Enerson) of Ankara, Turkey. Enerson’s report was reviewed to verify that information presented in this News Release is consistent with the report’s findings and that no quality issues were reported during data collection or processing. Sample and analytical data for Medgold’s soil sampling during 2016 and 2017 has been verified by reviewing Medgold’s sampling procedures and fieldwork reports for the work. Samples from both years were delivered to the independent ALS Geochemistry laboratory facilities in Bor, Serbia. The samples were prepared using method code PREP-41 and a 25 g aliquot of the -180 micron fraction was analyzed for gold and a multi-element suit using method code AuME-TL43. Drilling was carried out by independent contractors using PQ and HQ size tooling. Average core recovery for the program was 92%, Drill core was cut in half by Medgold using a rock saw with one half of the core then taken as a sample for analysis. 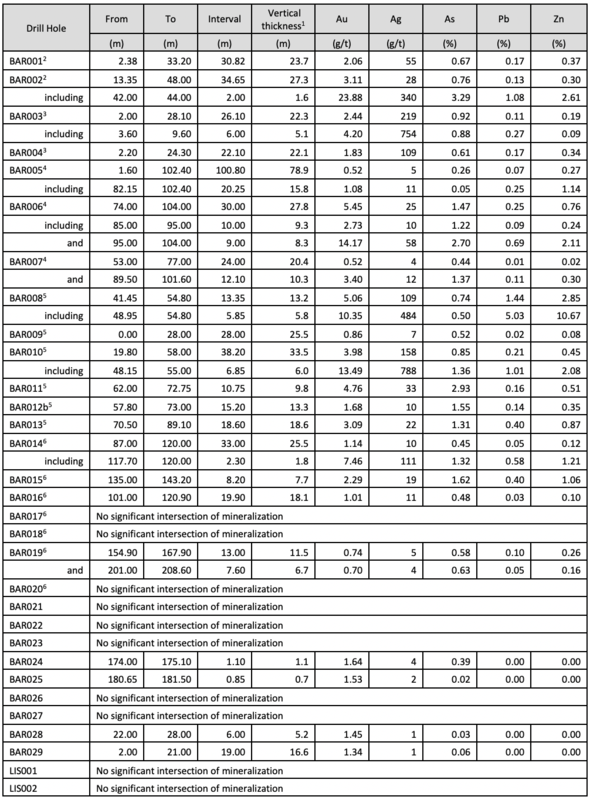 Sample intervals were generally between 50 to 150 cm producing samples of between 2 to 9 kg. Samples were delivered to the independent ALS Geochemistry laboratory facilities in Bor, Serbia. The samples were crushed and pulverized using method code PREP-31, were fire assayed for Au using method code Au-ICP21, and were analyzed for multi-elements using method code ME-MS61 following a four-acid digestion. Overlimits were analyzed using an appropriate method. Medgold routinely inserted multi-element geochemical standards, blanks, and field duplicate samples into the drill core sample stream as part of a documented Quality Assurance/Quality Control (QAQC) process to monitor laboratory performance, during the 2018 drilling program QAQC material was inserted into sample batches at the following rates per primary sample: ¼ core duplicates 1 in 30; granite blanks 1 in 30; certified reference material (CRM) 1 in 15. When laboratory analysis results for CRMs did not pass Medgold’s QAQC controls, and the CRM’s had been inserted in a sequence of mineralized samples, the CRM’s and surrounding samples of similar grade were re-assayed until results passed Medgold’s QAQC controls. Sample grades were checked against recovery percentage for potential bias; no discernable high- or low-grade bias was observed. Mineral Resources were calculated in former-Yugoslavia according to laws and regulations applicable at that time, defined specifically by “Zakon o jedinstvenom načinu utvrđivanja, evidentiranja i prikupljanja podataka o rezervama mineralnih sirovina i podzemnih voda i o bilansu tih rezervi” (The Law on the Uniform Method of Establishing, Recording and Gathering Data on Reserves of Mineral Raw Materials and Underground Water and Their Balancing), Službeni list SFR Jugoslavije, br. 53/1977; and by “Pravilnik o klasifikaciji i kategorizaciji rezervi čvrstih mineralnih sirovina i vođenju evidenciije o njima” (The Book of Regulations on Classification and Categorization of Reserves of Solid Mineral Raw Materials and Keeping a File on Them), Službeni list SFR Jugoslavije br. 53/1979.